When mom was here a week or so ago, I asked her – in a moment of temporary insanity – if she would mind helping me clean out my pantry. Oye Vey! That’s all I’m going to say about that. Why on earth I thought this would go off without a hinge with my ultra-organized mother is beyond me, but I think there was wine involved when I posed the question. Perched from a stepping stool, I handed her things to throw away that dated back from the time in which Walkman cassette players were all the rage, some of which had a distinct Belgian label and clearly came from another era one of her past visits, so naturally, that yielded my mother’s trademark disapproving eye… and I completely deserve it, really. The thing is, I’m so Scrooge-like with my goods from Belgium that I sometimes forget I even have stuff like ‘Royco Asperge Minuutsoep’… or worse yet, save it for a ‘special’ occasion. If you’re from Belgium, try not to laugh. Okay? And then there are those times in which I find myself dillydallying in the Manhattan Village mall, usually killing some time waiting for a flight to come in at LAX or so, and inevitably end up buying nonsense from places like ‘Harry & David’ or ‘Williams-Sonoma’, because I am famished and bored I saw a need for silly things like powdered Tikka Masala mix (can I plead the Fifth here?) or a box of jalapeno corn bread, both of which get shoved next to the Vidalia Onion Dressing mix that was gifted to me in a company Christmas basket earlier. And all of which live clandestinely underground in my pantry for years, until I can’t take the clutter anymore and I go on a cleaning spree… Please tell me I’m not alone in this madness? Anyway, amid our frenzied pantry reorganization, lurking behind my basket of ‘usual’ suspects, I did notice a baggy of dried tarragon from Penzey’s Spices and suddenly remembered my impulsive ambition to try and recreate a mustard-braised chicken stew I saw Jacques Pepin make on our local ‘Create’ television network…. last Winter! Well, I’m happy to report that ‘last Winter’ has finally arrived and the recipe is listed below. I made this one in my super-duper slow cooker, but you can easily use a heavy Dutch oven as well. If so, turn the time down to 2 hours or so. (*) You can use fresh or jarred artichoke hearts as well, but they have a tendency to disintegrate in the cooking process in a slow cooker. Wash and pat the thighs dry, then season with salt & pepper. In a heavy pan, heat the olive oil and brown the chicken thighs on all sides. When browned, transfer to the insert of your slow cooker. Without rinsing the pan, add a tablespoon of butter and brown the mushrooms, onions and garlic until all of the liquid has evaporated. Deglaze the pan with the wine, scraping up all of the browned bits. Stir in half of the dried tarragon, simmer a minute more and transfer contents to insert of slow cooker. Add frozen artichokes to insert as well. 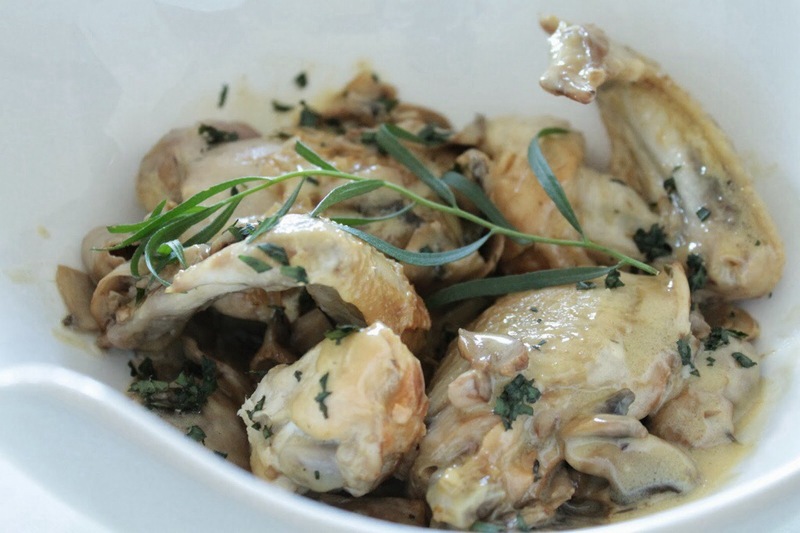 Combine chicken broth with remaining dried tarragon & mustard, and stir well. Pour over the chicken in your cooker, and braise on ‘low’ for approx.. 4.5 hours until the chicken is fall apart tender. Add heavy cream to slow cooker, stir and let simmer for another 15-30 minutes or until the sauce has thickened a bit more. Finish off with a few sprigs of chopped fresh tarragon immediately before serving. This dish pairs well with roasted potatoes or rice.